The Nikon Coolpix P6000 is thicker and heavier than your average slim-line, fashion-conscious snapshot camera, but it's still remarkably diminutive given the 4x optical zoom lens and chunky DSLR-like handgrip. It just about fits completely in your palm, and is certainly much more pocketable than Canon's chunky rival, the PowerShot G10. From a purely practical point of view, the P6000 is a godsend for those looking for a realistic alternative to lugging around either a 'super zoom' bridge camera or actual DSLR. You can easily slip it inside a coat pocket, without having to compromise too much on features or handling. Pulling off with aplomb that manufacturer's trick of ensuring the camera feels at once solidly constructed yet at the same time reasonably lightweight, the P6000 boasts the kind of magnesium alloy chassis and rubberized grip normally found on Nikon's DSLRs. The revised hand-grip is a real joy to use, with a new textured area adding a level of handling reassurance that perfectly suits the camera's professional leanings. The front 'business' end of the Nikon Coolpix P6000 features the aforementioned 4x, 28-112mm equivalent optic surrounded by a metal lens ring that can be unscrewed to allow for supplementary Nikon attachments such as wide angle or telephoto converters. Although it offers a slightly shorter telephoto focal length compared to the P5100 , I suspect that the majority of users will welcome Nikon's decision to incorporate a wide-angle 28mm setting. Gaining 7mm at the wide-angle end makes a much bigger difference than losing 13mm at the telephoto end, making it much easier to shoot subjects like buildings in narrow streets, or a group of your friends in a confined space. Less impressive is the maximum aperture at the 112mm telephoto setting - f/5.9 doesn't really cut it on a camera aimed at serious photographers - and the barrel distortion is also quite noticeable, although you can turn on the Distortion Control option to partiallly compensate for this. Bottom left of the lens is a pin-prick like hole for the built-in microphone which delivers the usual slightly tinny, echo-y but perfectly acceptable sound, above which are two larger single bulbs, one that doubles as a self timer plus AF assist lamp, and another that acts as an infra red receiver for use with the optional ML-L3 remote control. Above these bulbs, you find the glass window for the optical viewfinder. It's rather murky, but peer through it and you can spot visible barrel distortion at the lens' maximum wide angle setting, which appears slightly less pronounced on the LCD alternative. I only really used the optical viewfinder on the rare occasions that it was just too bright to see the LCD screen clearly. Directly right of this is the built-in flash, a welcome improvement on the P5100's flash unit, as it pops-up above the lens and therefore provides more clearance and less chance of unwanted red-eye in your photos. On the front slope of the Nikon Coolpix P6000's grip is a springy shutter button with a definite halfway point � the camera taking a brief moment to determine focus and exposure but with no discernable shutter delay thereafter � surrounded by a zoom lever. Positioning the zoom control here has freed up space on the camera back for a rubberized indentation for the thumb, allowing for a firmer overall one-handed grip. The zoom is pretty quick to respond � even a slight nudge has it ratcheting back and forth, sound-tracked by a mechanical gnat-like buzz � which means that it's tricky to get framing spot-on in a single press. Still, this a minor irk. Just behind the shutter release button is a small but clearly marked on/off button with a teeny but bright green adjacent lamp to signify the power is indeed on. Give it a press and the P6000 powers up in around two seconds, the lens barrel extending to maximum wide-angle setting and the rear LCD blinking into life. Dwarfing this � and a great idea carried over from Nikon's DSLR cameras � is the unmarked command dial. Immediately lending the camera a proper 'grown up' feel, this falls readily under the thumb, and allows you to quickly set the aperture and shutter speed, or browse through a sequence of images in playback, amongst other functions. The command dial provides a very neat solution that is wonderful to use, especially if you are a regular Nikon DSLR user. Still atop the Nikon Coolpix P6000, but located slightly off-centre is a large-ish mode wheel, again similar to what you'd find on a consumer-level DSLR. Ranged around this we find the usual suspects of Auto, Program Auto, Shutter Priority, Aperture Priority and Manual, plus Movie mode, and Scene modes. There are also four brand new options, with GPS being the most exciting. The P6000 is the first compact camera to feature built-in support, allowing you to seamlessly geo-tag your photos (co-ordinates are stored in the EXIF data) and then sort and display them using a service like Google Maps. Or at least, that's the idea. In practice, the implementation is rather more under-whelming. To enable GPS, you have to select the GPS option on the mode dial, which then causes the P6000 to search for a GPS signal and acquire a position lock (if tunred on for the first time, or after the battery has been removed and replaced). The P6000 has a weak receiver, taking over 3 minutes to lock onto a signal in central London, and then often losing the position entirely when moving between high-rise buildings, or simply stepping indoors. It only consistently worked in areas of clear space - not great for all the urban photographers out there, which is arguably when it's most useful. The other downside is the tremendous drain on the battery when leaving GPS enabled, as the camera subsequently checks for a signal at regular intervals (the default option is every minute), even when its powered off. Nikon claim a CIPA-certified battery life of 260 shots, but turning on the GPS almost halved this total. The P6000's GPS integration is a logical addition that I hope other manufacturers will follow, but the combination of weak receiver and poor battery life ultimately conspire against it. The next option on the mode dial accesses My PictureTown mode, which allows you to choose up to 30 images to upload to Nikon's online photo storage service using the built-in Ethernet connector, located on the bottom of the camera. As with the P6000's GPS mode, LAN connectivity does not live up to initial expectations, in that you can't actually access the camera's contents over a network, which would have been a useful way to share and transfer your photos. Instead, it's solely used to upload photos to Nikon's My PictureTown online gallery, with 2Gb of space being provided for free. Despite the initially confusing number of options (covered by 14 pages in the user guide), it was fairly straight-forward to configure and upload, with the MapView button allowing you to see your geo-tagged photos via Google Maps. What the P6000's limited LAN functionality does, it does well - just don't expect to be able to treat the P6000 like any other networked device. The final new shooting modes are marked U1 and U2. These are essentially customisable modes that allow you to register your most frequently used settings and then quickly access them via the mode dial. The action of the wheel itself is slightly stiff, meaning that you reach each chosen setting with a definite click and avoid accidentally shooting past the one that you wanted. Next up atop the camera is a hot shoe for an optional Nikon Speedlight flashgun, expanding the P6000's flash capabilities. We found that the built-in flash unit was fine for a bit of fill-in, with respectably quick recycle times and adequate range. And so to the rear of the P6000, where you find the small window for the aforementioned optical viewfinder up top and dead centre, next to which are teeny flash and auto focus lamps, but disappointingly no diopter adjustment control. Below this is the 2.7-inch LCD. Though its dimensions may be nothing special these days, it does the job, meaning that at no time do you feel it's too small or too dim for either accurate shot composition or review. Its 230k-dot resolution provides just enough detail for you to be able to determine whether you have a sufficiently crisp image, though in playback, maximum resolution images do take a second to 'build' from low to high-res onscreen. To the left of the LCD screen is a vertical row of five buttons. The top one is the function control, which can be customised to access one of 18 different options. As there's other dedicated button, I chose to set it to ISO sensitivity. The second button displays the My Menu, yet another way of customising the P6000 to suit your way of working. As with the U1 and U2 shooting modes, it effectively allows you to register your favourite menu options and then quickly access them. The third button activates manual focus, if that is the currently selected focus mode, magnifying the center of the LCD screen to allow you to judge the focus, and operating in conjunction with the command wheel and an onscreen vertical distance bar to set it. The fourth button down sports the familiar playback icon, while the fifth and final one is clearly marked Menu. Press this when in Auto capture mode and you're presented with a very limited choice, chiefly the ability to contro the l image quality and size. Turn the dial to Program and press again and you get a much more comprehensive array of controls, including the ability to optimise the image in-camera � namely make it softer or, my favourite, more vivid, as well as capture shots in black and white � manually adjust white balance, metering, speed of capture, AF area mode (face priority setting included), flash exposure compensation and so on. In playback mode, pressing the same menu button affords access to rudimentary image editing, such as Nikon's exposure adjusting D-Lighting function, image slide show, plus the ability to minimize file size for email if required. The button for controlling the screen display � either displaying all settings, calling up a nine zone compositional grid, providing a 'clean' screen or switching it off entirely, but irritatingly still no live histogram (although this button does call one up in playback mode) - has been moved to the right of the optical viewfinder. On the left of the viewfinder is the flash pop-up button, which has to be manually operated before you can choose a flash mode. The P6000's uncluttered, unfussy feel continues when we move over to the right of the LCD screen and find a familiar four-way controller that can be used for browsing through images one by one or more precise selection of menu options, with an 'OK' button at its centre being the means via which changes can be implemented. Ranged around this are means of (in conjunction with the screen) changing the flash setting, adjusting exposure compensation, selecting self-timer options or choosing the focusing mode. A new button underneath the multi-selector features the familiar trashcan icon for deleting images on the fly. On the right flank of the camera � if still viewing it from the rear � there's an eyelet for attaching the supplied shoulder strap, although doing so looks slightly ridiculous on a camera of this size, meaning I tried it out and immediately removed it. There's also a soft rubber cover protecting the A/V out / USB ports. On the left hand flank of the camera is an identical means of threading on the strap, plus the new GPS receiver. The built in speaker has been moved to the bottom of the camera, joining the centrally positioned, metal tripod mount. 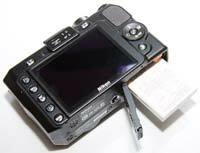 The P6000 is powered by a wafer-like 3.7v lithium ion battery that slots into the base alongside the SD card slot. Next to this, in the bottom of the handgrip, is the new LAN connector, not really the most logical position if you want to stand the camera up while transferring your photos. 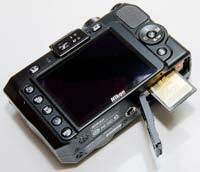 When the Nikon P6000 was first announced, it's RAW format implementation caused quite a stir. Nikon have teamed up with Microsoft to use the Windows Imaging Component (WIC) codec in Windows Vista (also available for Windows XP SP2 via .NET). The key benefit of this approach is to allow the operating system to decode the RAW files, rather than third-party software, but obviously this opened Nikon up to charges of ignoring MAC users and generally being in cahoots with Microsoft. Currently, the new NRW file format is actually supported by several third-party software vendors, including Adobe in the latest versions of Camera RAW and Lightroom (which are PC and MAC compatible), DCRaw and SilkyPix, so you aren't just limited to processing the RAW files in-camera, or using the Windows version of Nikon's ViewNX software or other WIC compatible programs. The initial hoo-hah seems to be less of an issue now. Which sadly can't also be said about the negative effect that using RAW has on the P6000's responsiveness. Maximum resolution JPEGS are stored in a couple of seconds, but RAW format is a different story entirely, essentially locking up the camera for around 5 seconds until the file is written to memory. If you then quickly take a second shot, the write time gets even longer. This is frankly unacceptable on a prosumer camera, and severely limits the type of photography that you can attempt when shooting RAW files - I'd go so far to say that it may put you off shooting RAW altogether. Continuous shooting is also one of the P6000's weak points. It can only capture 1 frame per second when shooting Normal sized JPEGs, for up to 5 images. There is essentially no continuous shooting if you select the RAW file format, with the camera taking a single frame and then locking up as in single-shot mode. Nikon have included their VR (Vibration Reduction) image stabilisation system to help prevent camera-shake, an increasingly de-facto feature on a lot of high-end compact cameras. Annoyingly there isn't a dedicated button to turn it on and off (it's somewhat buried in the Setup menu). In practice I found that the VR system makes a noticeable difference to the sharpness of the images, as shown in the examples on the Image Quality page. You don't notice that the camera is actually doing anything different when anti-shake is turned on, just that you can use slower shutter speeds than normal and still take sharp photos. It didn't seem to adversely affect the battery life either, so I'd advise you to turn it on and then forget about it. 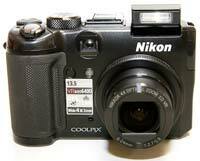 There are a few interesting features that help the Nikon Coolpix P6000 stand-out from the crowd. Distortion control automatically corrects barrel distortion, useful for all those 28mm shots of close-up architecture with converging verticals, but it does have to be turned on before you take a picture. Face-priority Autofocus can detect up to 12 faces in a scene just so long as they're looking directly at the camera, whilst In-Camera Red-Eye Fix automatically processes the picture to remove red-eye. D-Lighting is a long-standing Nikon technology that brightens the shadow areas of an image, with three different strengths available. Finally the Picture Control option allows you to tweak the look and feel of your images, with 4 presets and a Custom option on offer. The contrast, saturation and sharpening level of each preset can be individually adjusted too, so you should be able to find a setting that suits you. PhotographyBLOG is a member of the DIWA organisation. Our test results for the Nikon Coolpix P6000 have been submitted to DIWA for comparison with test results for different samples of the same camera model supplied by other DIWA member sites.